Unfortunately, I missed last night's meeting on "Accessing Public Space in Silver Spring" as I was in Cambridge. If you're reading this, I'm probably on my way home from Massachusetts now, but ace photographer and friend of JUTP Chip Py took these photos of the meeting. Local skaters came out in force to emphasize their claim to the newly-opened Veterans Plaza, where there's been some public outcry over their presence there. "No one told the Skaters about the Public Space Meeting," writes Chip Py on Facebook. "Kathy Stevens and I went out and rounded them up and invited them in. They were eager to come in and participate in the discussion. They really shined tonight." 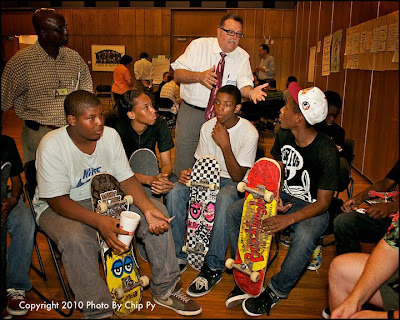 Reemberto Rodriguez, director of the Silver Spring Regional Services Center, talks to local skaters. Photo by Chip Py. Kathy Stevens from the Citizens Advisory Board with local skaters. Photo by Chip Py. The other big issue at the meeting was an arrangement between Round House Theatre and Montgomery County to use space in the new Civic Building, frustrating other nonprofit groups who don't have permanent offices in downtown Silver Spring. Earlier this week, Round House gave the Gandhi Brigade, a local youth media collective, one of their suites in the Civic Building for the group's use. On Friday the Round House Theater agreed to let go of their space on the plaza level for the sake of greater community access to the Civic Building. See Blake's letter below. This is a courageous and inspired step on the part of Round House. Lets make our gratitude concrete by communicating to our circles the knowledge and import of their public spirited action. You have probably heard that IMPACT, the Silver Spring Citizens Advisory Board, the Regional Services Center, and PREZCO are holding a public meeting on July 21 [sent to WPCA a few days ago] to address community access to public space. Blake Robison's bold move has set the stage (pun alert) for a constructive conversation that can move beyond our disappointments about how we got here and focus on where we want to go from here. There is much to do. The severe fiscal constraints on the County's ability to support programming and the disturbing violence in front of Baja Fresh have contributed to a lot of anxiety about the Town Center. These crises can also be the impetus for creative hearts and minds to come together to envision and enact a whole new way of behaving as a community. There are so many important areas to work on: safety, creating a new model for allocating public space, space for nonprofits, including marginalized voices, creating public space for young people, etc. They are all important and we are all responsible for focusing on our sphere. I am going to focus my energy on activating our new "Community Room." If we can find a practical way to activate this room with youth groups, art groups, cultural groups, empowerment groups, civic groups and whoever I am forgetting, I think we could make this room the model and the precursor for the Silver Spring we have all been working so hard to bring to life. Both very good pieces of news from yesterday's meeting. I'm glad to know Silver Spring didn't burn down while I was out of town, and I can't wait to see y'all when I get back tonight. He actually cites the fight in front of Baja Fresh as among his reasons for pulling out of the Civic Building? This explains why the Roundhouse Theater in Bethesda has so many more events than does their venue by the AFI. I'm guessing he doesn't read the news related to Bethesa. They have their share of issues, as well. While I think he may be overreacting, let's not pretend that Silver Spring is as safe as some other communities. What makes the situation particularity bad is that we have people traveling long distances (Anacostia) to cause trouble and assault people. Downtown Silver Spring must have a reputation as a place where thugs can hang out and not have problems. It's good to see the police handle this matter seriously, but the fact that people would travel so far to intentional disrupt the peace is not good. I don't travel to Alexandria very often because it is a trek. But we have to make it a hassle for people to be thugs in DTSS. Otherwise they'll come from all over the place just to get their jollies in. I walk around Silver Spring every day. To and from work, to the Metro, to the movies, to restaurants, etc. Things do occasionally happen, as they do in Bethesda, but it's not a dangerous place to live or be. I do agree that groups of people looking for trouble shouldn't feel welcome. Visible but not menacing police presence is a huge help. If skaters need a skate park, why does it have to be in DTSS? Why not put it in Wheaton or Bethesda? Or better yet, why don't the skaters go to an existing skatepark -- a quick google search turned up some very nice ones in Rockville and various parts of DC. DTSS is attracting trouble-makers, and a skatepark will exacerbate this. If Silver Spring wants to keep attracting people to live in this area and frequent the businesses, then it can't let some teenagers hold it hostage. Seriously, it only took a few days after the veterans plaza opened for there to be a serious crime against an innocent bystander. Enough is enough. John - I'm not particularly fond of having DTSS turned into a skate park either. But, it is what it is. The space is there and it is being used by skaters. I think it would just be empty space if they weren't there. I'm afraid the damage it will cause to concrete and the benches. I do think steps can be taken to make it manageable and less damaging. I do think it is quite a reach for you to say that skateboarders are attracting trouble makers and, even worse, to connect them to the recent incident there. So yes, skateboarders were involved. There's a reason that the incident happened right next to the ice rink -- it's where all of the skaters now hang out. Look, I'm obviously not saying that all skateboarders are criminals. But I am saying that having a skatepark in DTSS attracts problem kids to the area. I'm too lazy to point out the Gazette article stating that none of those involved in the incident are known skateboarders. Just because the kid has a picture taken with a skateboard does not make him a "skateboarder." I do think skateboarders can attract a certain element that may not be favorable. As much as their defenders tend to paint them as saints I tend to believe they aren't in the upper echelons of teenage society. But, DTSS is going to attract teenagers - a lot of them. Most will be from this area. Teenagers, when they congregate, tend to act like morons. We need to mitigate how they behave. If skateboarders have a place they can call their own they will work to protect that area. And, I think, that means they will conform to societal standards. If the skateboarders simply skated and kept to themselves that would be great, but they don't. Some of them write graffiti and deface public property. Also, most of them do tricks that involve grinding / sliding along surfaces of benches, steps, etc. And that damages property. Most of the kids who skate in Silver Spring live here in East County. Existing skateparks in Rockville or Olney don't do them any good, nor would one in Bethesda. From what I've seen, they do generally keep to themselves. I have not seen any graffiti in Veterans Plaza since it opened, and other than some scuff marks on a handrail, I haven't seen any other damage. As of yet, accusations that skater kids have wreaked havoc on the plaza are unfounded. It's really disappointing to see people automatically lump them in with troublemakers - from here or elsewhere - who I fully agree need to be dealt with. Not every kid who carries a skateboard is a scofflaw, and not every scofflaw carries a skateboard. Not a hard distinction to make, but some people still don't get it. 1. Within a few days after veterans plaza opened, a person was brutally attacked next to the ice rink that skaters were using. 3. The two attackers who committed the attack at the ice rink were from PG county and SE DC, not Silver Spring. My point here is a simple one: a skatepark does have a tendency to attract problem kids. Most of the skaters are fine, but it only takes a couple of bad ones to ruin the DTSS experience for everyone. Maybe in the end, the risk of the few bad apples is worth it, and we should build the skatepark anyways (though with the state of the MoCo economy, I can't see it happening anytime soon). But if it's going to serve the kids of SS, then it shouldn't be in downtown. SS kids shouldn't need a place that is a metro-accessible. Maybe a spot near one of the rec centers would work and might actually be closer to where most of the skaters live. John M, the guy in this picture is holding is A TOY -- it is NOT an actual skateboard, and being about half the size of an actual skateboard, no real skater would be able to skate that thing. Also, you may not realize that since 2000, the Master Plan has called for a skatepark in downtown Silver Spring, in part to help preserve property, because as the adage goes, if your city doesn't have a skatepark, your city becomes a skatepark. In my blog post The Arguments for a Skatepark in Downtown Silver Spring, I explain that skateparks save lives, and if this community actually cares about childhood obesity, we might want to support those kids who want to lead active lives, but have no place to participate in the sport that's keeping them active and away from the crime and negativity that you're so worried about. Skateparks tend to reduce crime in the areas where they're built, and there's much more of a consciousness about that in the midwest and west coast, and because of that, there's much less resistance to skateparks being built in those areas. You have some very negative views about many of our teens, simply because they participate in what is now the fastest-growing sport in America. In 2000, Montgomery County planners, in their wisdom, saw the building of a downtown skatepark as a way to avoid all of the issues and problems we are having now. 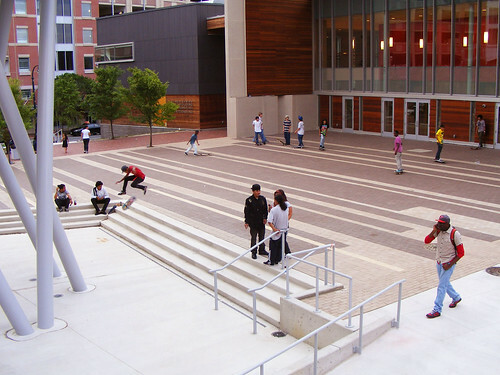 If we had a real skatepark in Silver Spring, there is not one skater who would bother with Veterans Plaza, where we are now restricted to skating flat ground. Skateboarders do not love skating flat ground -- the primary challenge of this sport involves jumping over obstacles. There are no obstacles in the ice rink area for skaters to jump over. Veterans Plaza only has appeal to skaters because we have nothing else. And the Woodside Skate Spot, which is THE smallest skatepark in the entire DC, MD, VA areas, can only support 7 skaters at one time, so it certainly won't keep kids off other properties in downtown Silver Spring. Sorry, but you shouldn't even be skating at Veteran's Plaza. It's not a skatepark, nor was it designed to hold up to the constant slamming on the concrete or grinding on rails. Just because there's an open expanse of concrete does not mean skaters have the right to just take it over, without consideration to the general public and the entire tax paying population of the county. I skated growing up, and I never thought of skating in a public park where I would be disrupting other people. I set up homemade rails and ramps in my driveway, and that was good enough for me. Ian, how nice that you were fortunate enough to grow up having a driveway to set up rails and ramps in! And parents who let you do that! I see that Veterans Plaza means an awful lot to you, and that the needs of kids who have nothing but skateboarding, and no place to do it, apparently means nothing. I care a whole lot more about the lives and the welfare of children than I do about property, and if Silver Spring had a real skatepark (like it's supposed to), we would not be having this conversation. And so we now know the problem with Smart Growth. Building apartments and condominiums around small business araes and hubs of public transportaion with the emphasis on public transportation and the feely touchy sensation of being ale to walk to nearby stores and restaurants and artificial parks-oh how wonderful! and other board games, and of course- your dog had his own park to run in- also the backyard. Give my old fashion backyard and porches. Different strokes for different folks, Bob. Not everyone wants, needs or can afford a house with a lawn. And you can still have BBQs — my new apartment in Philly has one. And, besides, don't you live in a condo yourself? Yes Dan I do live in a condo. I sold my house 12 years ago- but I do not have a family to support or kids. I am 59 years old, and I realized 12 years ago living in such a big house(6 bedrooms, 4 bathrooms and 2 kitchens)was not what I wanted. I had already enjoyed my big porch and backyard cookouts- it was time to downsize. As for places to skateboard. We made our own skateboard way backk then,, and we would walk up to Sligo Jr.High, and skate there, play softball. football, capture the flag and basketball. We did not need special places built for us they were already in existence. By the way. when you come back to Silver Spring from Philly for a visit- will you bring me cheese-steak? Of course I'll bring you a cheesesteak. I hope that after a long and often contentious comment thread, we can all agree that cheesesteaks are a yummy, if not particularly healthy, food. WTH? It wasn't being kept secret from them as this statement implies. No one "told me" about it either, but I certainly knew about it from multiple sources. I crack open the newspaper and log onto local blogs everyone once in a while so I know about issues that directly impact my life. If they cared about the local community at all, they'd have known. Washington Gardener, the people you're talking about, who you say should have known about this meeting, include a huge pack of kids, and one currently homeless adult. It's kind of hard keeping up with local blogs and what not when you're homeless. And to claim that children don't care about their community because they don't read local blogs, is asinine. You've made quite a few snipey comments about skateboarders, on several blogs. The fact that you don't like kids who happen to ride skateboards, is quite obvious. FYI, there is now a "no Skateboarding" sign up. I don't know when it went up, b ut when I went by today around 6:30PM it was there and, maybe by chance, the plaza was free of skateboarders.